CANBERRA, Australia (AP) — President Donald Trump had agreed to keep an Obama administration promise to resettle refugees languishing in Pacific island camps despite the U.S. toughening its stance on Muslim immigration, the Australian prime minister said Monday. Trump had agreed that during a 25-minute telephone conversation on Sunday to accept an unspecified number of refugees as promised in the final months of the previous administration, ending weeks of uncertainty, Prime Minister Malcolm Turnbull said. “I thank President Trump for his commitment to honor that existing agreement,” Turnbull told reporters. He declined to say how many refugees might be resettled in the United States. The Obama administration had agreed to resettle refugees among the almost 1,300 asylum seekers held on the island nations of Nauru and Papua New Guinea. Another 370 who came to Australia for medical treatment and then refused to return to the islands would also be eligible. Most of the asylum seekers are Muslims from the Middle East, Africa and Asia. Australia refuses to resettle any refugee who has arrived by boat since the date the tough policy was announced on July 19, 2013, and pays Nauru and Papua New Guinea to house them and has been searching for countries that will resettle them. Turnbull declined to comment on Trump’s immigration order that effects travel to the United States for people from seven Muslim-majority countries. Turnbull said no Australian had sought consular assistance over the order, which has sowed chaos and outrage across the United States with travelers detained at airports and protesters demanding the order be changed. 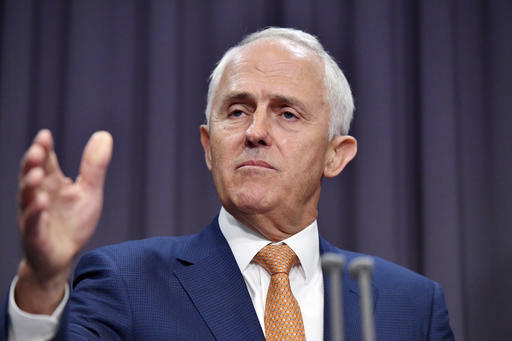 “It’s not my job, as prime minister of Australia, to run a commentary on the domestic policies of other countries,” Turnbull said. Any refugee who refuses to go to the United States would be given a 20-year visa to stay on Nauru, a tiny impoverished atoll with a population of 10,000 people. Turnbull has said the most vulnerable refugees would be given priority. Tags: #TrumpAcceptRefugees, Australia, immigration, Trump. Bookmark the permalink.